One of the most protracted signings of a marquee player is finally over. 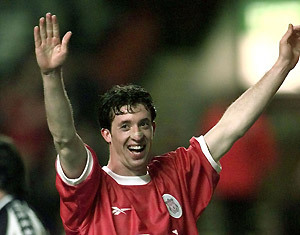 Robbie Fowler, the former Liverpool great, is A-League bound heading to the North Queensland Fury. While his signing represents a significant development for the club and the league in general, question marks over his fitness cloud his potential as the “new Dwight Yorke” of the A-League. Not since Yorke, who helped boost crowd figures across the country and Sydney FC to the inaugural title, has a star name with such pulling power and recognition committed to a full A-League season. The popularity of the EPL has grown exponentially down under and the Fowler signing will help connect that supporter base to the A-League. The 33 year old has a formidable record and the ability of an A-League franchise to be able to sign such a star name, in particular a new franchise, demonstrates we do have some pulling power relative to the likes of the American MLS. With no real star name import gracing the A-League this season, Fowler will help boost crowd figures and interest throughout Australia and the EPL mad Asia. However, he has to play regularly to achieve that and there is the concern over his fitness having only played three games during his very brief stint at Blackburn Rovers while ankle injuries plagued his time with Cardiff City. There is also the concern of how Fowler will cope in the intense heat and humidity of North Queensland, quite different from the conditions he experienced in Cardiff and Liverpool! A worrying comparison can be made between Adelaide United’s marquee signing Paul Agostino whose return from Europe was plagued by injury. Let’s hope Fowler stays fit. The Fury needs him. The A-League needs him. Another star marquee failure will damage the A-Leagues reputation, we don’t won’t the league to become just a retirement home for washed up stars that don’t play regularly. The Fury have been well and truly trumped by Gold Coast United in the battle off the field before the clubs join the competition next season. Their expansion rivals down the Queensland coast have stolen much of the attention with a rash of stunning signings including the bombshell enticing of Socceroo Jason Culina and Johnny Warren medallist Shane Smeltz. The Fury’s signings thus far have been conservative to say the least. The current squad won’t send other A-League franchises into a panic like the Gold Coast United line-up will. The marquee player position at the Fury has been the subject of much speculation. Adelaide United defender Cassio was rumoured to be filling the position but backed out of the deal while Jade North signed on from Newcastle before he was released to complete his move to South Korea. Never the less, the Fury finally has their marquee player. A player with the pulling power worthy of the marquee tag, if he plays! Hopefully the Fowler signing will be the impetus in attracting quality players up north. Let’s just hope he can do the business on the pitch so he can have a positive influence off it.